So glad I found Poweramp! What an amazing program! My applause to the developer! #1) Can you give me a checklist of all the things I should "switch off" to REDUCE BATTERY USAGE? 1) Not really. Turning off high-res audio will probably help, as will disabling wakelock/keep services (but PA may not function properly when the screen goes to sleep if you do that). 2) It is not currently possible to remove the thumbnails (that space is also used for multi-select operations by the way, and remember that sometimes the contained files will have different embedded track artwork). The best you can currently do is use the Compact List view type. Oh, and on some recent devices having the Chromecast feature turned on when you have a chromecast device attached to your network (but not in use at the time) can apparently cause increase battery usage. Turning the option off in PA is sensible if you don't use it. ALSO, I was thinking . . .if I can't turn "off" the arbitrary image appearing with all my music tracks . . . cause there needs to be SOME image there . . . . is there a way I can PICK the image to be used? It seems PA has sort of "arbitrarily" picked one image (randomly) and assigned it. Can I control WHICH image will appear . . . instead of that random image? 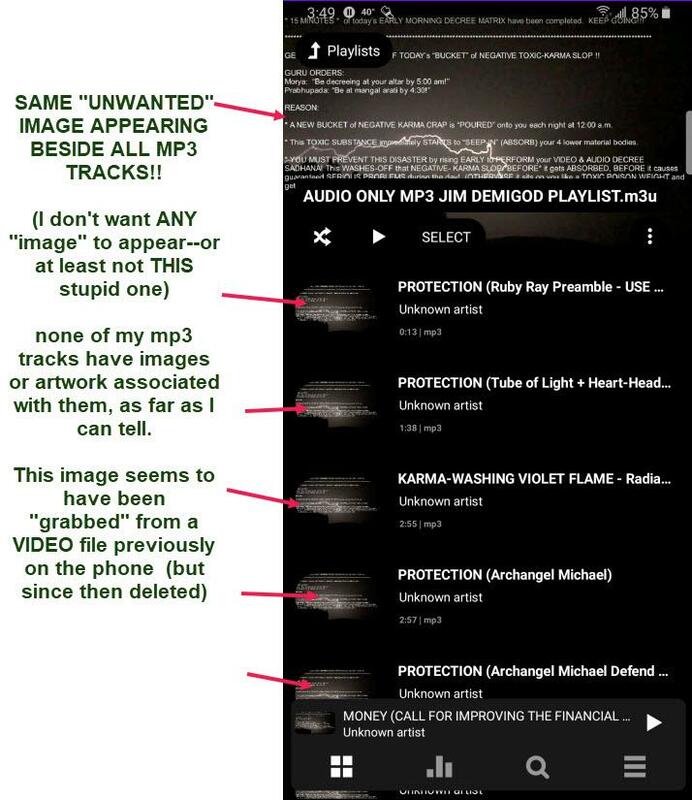 Album art is normally picked from the embedded artwork image saved inside the first track of an album (since artwork is stored per track, not per album). If your music files do not contain any embedded artwork, PA will download the best match it can find online, or you can long-press on the cover artwork area in the main player screen to chose a better alternative for yourself. You can also use your own images, including saving a cover.jpg file in the relevant folder. There are various options controlling how this all works in Settings > Album Art. Ok. I just went to my Mac (source for the mp3s) and used ITunes to "select all" then "change artwork" then picked my preferred image (identical to the "Chart of the I AM Presence" logo here in my Poweramp user profile), and it assigned that same image to ALL the mp3s in my library; Then synched all the mp3s and the iTunes playlist . . . FROM my Mac Mini . . . TO my android phone . . . using 'Isyncr' app ( http://www.jrtstudio.com/iSyncr-iTunes-for-Android ) . . . then "RESCANNED" in PA . . . all done! Now all tracks have my very favorate image. Well, none of my mp3 files have artwork. They are 'custom-made' meditation voice recordings. I made them. Since PA insists they have SOME artwork (or it will do it!) . . . it's great that I can pick one uniform image for all. Ah, that makes sense then. It seemed a bit odd if they were commercial songs, but I see why now.